on consecutive days...just before the end of the year! A birthday celebration is always special. But to have our Luk Tung Kuen family sing Happy Birthday is extra special. PLUS the fact that Lulu’s and my birthday are just one day apart from each other. 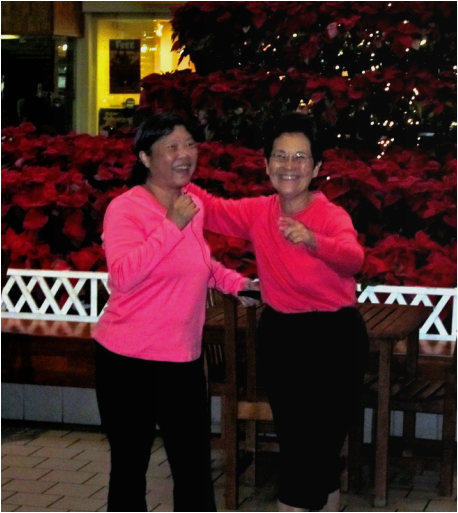 We work as a team and share the responsibility of teaching LTK at both Kahala Mall and Hawaii Kai Towne Center, a total of four times per week. It is our service to the community that has given me great appreciation of whoever I meet. It also gives me lots of satisfaction to teach and hopefully keep everyone fit and healthy. Today, December 30, our family has a double celebration. Our grandson, Ethan Kang turned 7 years old today. He and his brother Aaron who live in San Mateo called to sing Happy Birthday to me and I in turn sang to ET. Seven years ago, our daughter Clarissa called at 5 AM and announced that she was in the hospital after having delivered ET at home. She, bravely with the help of Frank, delivered Ethan at home before they had time to drive to the hospital. I was scheduled to be in California ahead of time, but this time I was “beaten to the draw”, so to speak!! What a great Birthday gift this is! We were secretly hoping to have our 7th grandchild to be born on December 30 too!! However, baby Ami Maile Chun couldn’t wait and arrived at 4AM, December 25, 2011, on Christmas Day!